WHEN I WAS CHILD, OTHER THAN FOR INTERMITTENT, SADISTIC OUTBREAKS OF ERSATZ FOLK DANCING (WHO WERE THESE FOLK?) IN AN OTHERWISE ART-POOR PRIMARY SCHOOL CURRICULUM, I THOUGHT DANCING WAS THE UNNATURAL EXTROVERSION PROMULGATED IN MGM MUSICALS AND THE NUMEROUS 60/40 (60% MODERN, 40% TRADITIONAL) GATHERINGS MY PARENTS FREQUENTED ACROSS THE 1940S AND 50S. THE DANCING WAS ACCESSIBLE, DILUTED BALLROOM. NOT INFREQUENTLY, I WOULD FIND MY FACE THRUST AGAINST THE TUMMY OF SOME HEAVILY CORSETED MATRON VIGOROUSLY TRIPPING THE LIGHT FANTASTIC. Such events were wonderfully sociable, staged in a variety of halls in a wide range of nearby suburbs, organised by sports clubs, businesses and lodges and with quite a class mix (if not ethnic in the 50s). My mother’s disdain for Catholics partially evaporated when she discovered a local church held dances of a Sunday evening. A title like Oh! I Wanna Dance With Somebody conjures for me a time when dancers actually held each other, pre-Twist, pre-disco, as a matter of course in massive numbers for many hours across the globe. However, although the program for Oh! I Wanna Dance With Somebody features Tea Dancers, most of the partners in dance that we’ll see perform are engaged in quite some other intimacies. In RealTime 109, in “New niches, new dance audiences,” Martin del Amo updated us on the burgeoning contemporary dance scene in Sydney’s west. One of the main forces in that thrust has been the perpetually innovative Campbelltown Arts Centre, its dance program curated by Emma Saunders, a member of Sydney’s famed The Fondue Set. As the culmination of three years developmental dance work, CAC is presenting Oh! I Wanna Dance With Somebody, programmed over three days in October and rich in community, cross-artform and intercultural engagement. Saunders cites “two other curatorial thoughts running behind the project. Oh! I Wanna Dance With Somebody looks loosely at where dance and community can intersect. It’s very ‘in’ to have community projects and I’m very interested to see what that means for artists—how does work connect with an audience, where does it start, finish, who are we dancing for, who’s dancing with us? That’s an ongoing dialogue I’m floating with each of the projects. We chat about the partnerships which have been nurtured. Saunders tells me that “dancer Anton and visual artist David Capra are developing a dancing duo. They look similar, both are of Ukrainian origin and wear black-framed glasses. We put them in a room and a work has organically evolved over four weeks in two-week blocks. They’ve had a good, strong critical dialogue. And David is a good dancer and is a very physical visual artist and this gives Anton the opportunity to dance in a different way. They’ll present the finished work on the weekend. Readers might remember the excitement occasioned by Ben Speth and Stompin’ Youth’s WeTubeLIVE for the 2010 Junction Festival in Launceston (RT99). Saunders has invited Speth to realise a version of it for her dance event in which she will “fill the gallery spaces with 100 performers. This involves a great deal of work,” she admits. Saunders has been corralling dance groups, line dancers, Indian dancers and community members who have had something to do with CAC in recent years. 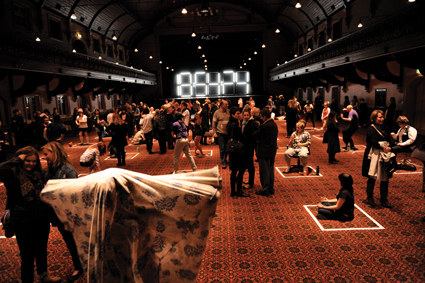 “The performers each choose a favourite clip from YouTube and perform it forward and backwards at timed intervals in a one-metre square each.” The audience move among the performers. For Oh! I Wanna Dance with Somebody, the galleries will be cleared of artworks, says Saunders, “so that the bodies are the art,” and the foyer will become more like a lounge. WeTUBE will be performed on the opening Friday night. The dance partnerships will be on the Saturday from 10am-10pm with improviser par excellence Andrew Morrish commencing the day’s proceedings by anticipating what he thinks he will see and then, later, declaring precisely what he has witnessed. On Sunday there’ll be a forum with the artists, community leaders and audience with a performative curator’s introduction from Saunders. There’ll also be handouts about works, a publication down the track and a photographic record created by Heidrun Löhr. As we conclude our conversation, Emma Saunders finally mentions the Tea Dance Project performers who, on opening night, “will actually dance with each other.” Could make us all wanna dance.